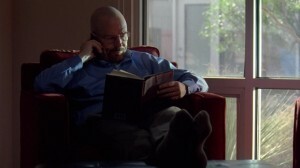 On “Breaking Bad,” this is the book given to Walter White and discovered by Hank Schrader. A near-facsimile edition that captures the typeface, design and layout of the original edition, with an afterword by David S. Reynolds and an appendix containing the early reviews of the volume. So begins Leaves of Grass, the first great American poem and indeed, to this day, the greatest and most essentially American poem in all our national literature. The publication of Leaves of Grass in July 1855 was a landmark event in literary history. Ralph Waldo Emerson judged the book “the most extraordinary piece of wit and wisdom America has yet contributed.” Nothing like the volume had ever appeared before. Everything about it—the unusual jacket and title page, its exuberant preface, the twelve free-flowing, untitled poems embracing every realm of expe­rience—was new. The 1855 edition broke new ground in its relaxed style, which prefigured free verse; in its sexual candor; in its images of racial bonding and democratic togetherness; and in the intensity of its affirmation of the sanctity of the physical world. 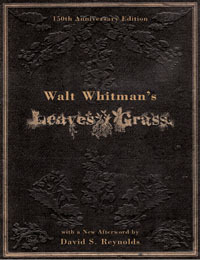 This 150th Anniversary Edition captures its typeface, design, and layout of the original edition supervised by Whitman himself. Today’s readers get a sense of the “ur-text” of Leaves of Grass, the first version of this historic volume, before Whitman made many revisions to both format and style. In an afterword, Whitman author­ity David S. Reynolds discusses the 1855 edition in its social and cultural contexts: its background, its reception, and its contributions to literary history. There is also an appendix containing the early responses to the volume, including Emerson’s letter, Whitman’s three self-reviews, and the twenty other known reviews published in various newspapers and magazines. This special volume is a must-have keepsake for fans of Whitman and lovers of American poetry.